Director – Roger Corman, Screenplay – Robert Towne, Based on the Short Story Ligeia by Edgar Allan Poe, Producer – Pat Green, Photography – Arthur Grant, Music – Kenneth V. Jones, Special Effects – Ted Samuels, Makeup – George Blackler, Art Direction – Colin Southcott. Production Company – American International Pictures. Verden Fell buries his late wife Ligeia after she commits suicide. However, he is certain that she is not dead. Some time after, Rowena Trevanian, the daughter of a neighbouring lord, is thrown on top of Ligeia’s grave by her horse during a fox hunt. Fell appears and insists she come to the abbey where he lives so that he can tend her. Rowena becomes fascinated by the strange, morbidly preoccupied Fell and agrees to marry him. After the marriage however, Fell becomes obsessed, seeing Rowena as being possessed by the spirit of Ligeia. The Tomb of Ligeia was the eighth and last of Roger Corman’s Edgar Allan Poe adaptations. (See below for the other Roger Corman Poe titles). It is claimed in some quarters that The Tomb of Ligeia is the best of the series. Bearing this in mind, one however finds it the most overrated of the Roger Corman Poe films. The plot shuffles around the basic elements of the rest of the Corman Edgar Allan Poe films – love from beyond the tomb, possession, the doom and gloom obsessed hubbie, the pretty innocent bride driven around the bend by such obsessions, the gloomy Gothic mansion, sinister black cats, a neurotic and cowering Vincent Price suffering from hyper-acuteness of the senses, and everything going up in flames at the end. However, the lack of much connecting logic behind it all makes it an uninspired rehash. The English location shooting makes a welcome relief from the usual fog-laden sets of the earlier films. 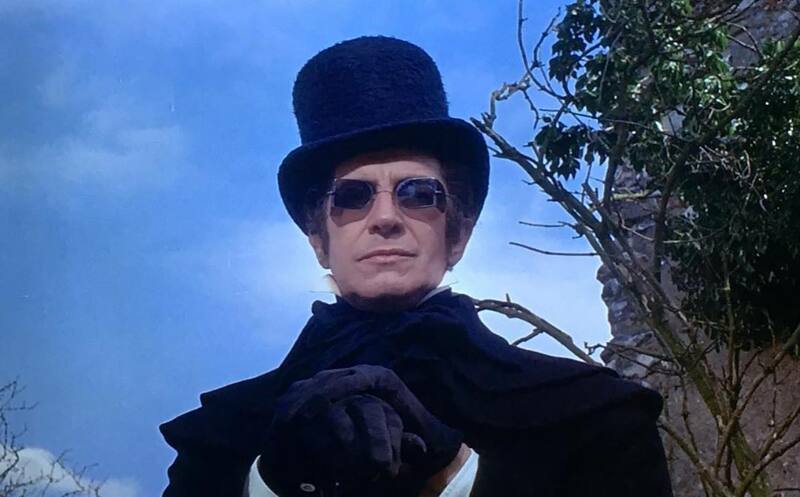 Indeed, this takes The Tomb of Ligeia closer to the Hammer horror films that inspired Roger Corman’s Poe series in the first place. However, Corman and his cast hardly seem to be doing much more than playing a game of hide-and-seek in a set of Gothic ruins (the remains of the 11th Century Castle Acre Prior in Norfolk). Vincent Price’s usual clipped, overwroughtly enunciated delivery is okay. A scene where Elizabeth Shepherd is hypnotised and possessed by Ligeia contains a good jolt. Yet, the film is still no good – the dialogue is flowery, the pace slow, nothing much ever happens and when it does is never properly explained. The script was from Robert Towne who started his career out working for Roger Corman, writing the script for Last Woman on Earth (1960). Robert Towne later went onto become one of Hollywood’s top screenwriters with scripts for films like Chinatown (1974), Shampoo (1974), Greystoke: The Legend of Tarzan, Lord of the Apes (1984) and the Mission: Impossible films, among others. Other adaptations of Edgar Allan Poe’s Ligeia (1838) include:- an Argentinean tv production in 1959 about which little is known; Ligeia (1981), a French production with Arielle Dombasle as Ligeia; Ligeia (2002), a low-budget US made version; the modernised Ligeia (2009); and a new US-made indie version Ligeia (2012), as well as several short film versions. The Tomb of Ligeia was later spoofed in Elvira’s Haunted Hills (2001). Roger Corman’s other Poe films are The House of Usher/The Fall of the House of Usher (1960), Pit and the Pendulum (1961), Premature Burial (1962), Tales of Terror (1962), The Raven (1963), the Poe-titled but H.P. Lovecraft adapted The Haunted Palace (1963) and The Masque of the Red Death (1964).